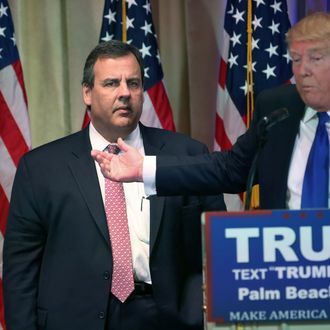 Donald Trump, the presumptive Republican presidential nominee, held a fundraiser on Thursday that he claimed would pay off the entire campaign debt of his erstwhile rival (and suspected hostage) New Jersey governor Chris Christie, the Associated Press reports. The $200-per-person fundraiser at the National Guard Armory in Lawrenceville, New Jersey, attracted around 1,000 people, which would indeed come to just about enough to clear the Christie campaign’s debt of about a quarter-million dollars. “You know Chris paid off his entire campaign debt tonight, right? His entire debt,” Trump told the crowd before launching into a stump speech replete with praise for New Jersey’s economic record under Christie’s watch. But being Trump, he couldn’t resist a zinger at the governor’s expense while discussing his personal boycott of Nabisco for moving jobs out of the U.S.
For the real movers and shakers, Thursday’s event also included a $25,000-a-head fundraiser for the state Republican party to cover its $500,000 in legal fees pertaining to the 2013 George Washington Bridge lane-closure scandal.